The relaxation of permission for cow slaughter by the East India Company was reaching the smaller cities and towns in Punjab. 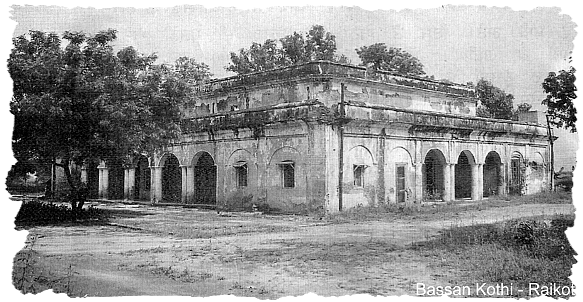 The permission to open butchery at Raikot was given by an officer of Ludhiana district (named Rickets) in 1856. It was approved by Governor General Lord Canning. A Slaughterhouse was opened away from the city but it was very close to Gurudwara Tahliana. A group of mendicants resided nearby and a pond was also in the vicinity. Butchers named, Ranjha and Buta, deliberately instigated the Sikh devotees. They carried uncovered beef in baskets. This attracted crows and dogs that carried meat morsels, pieces of flesh and bones and pricked on these, and deposited them on the dome of the Dera, its walls and roof-tops. Same was the situation in the Gurdwara. It was being desecrated by pieces of bone and flash covering the area in and around the gurdwara. The residents, priests, granthis and the sevadars were all perplexed. They used to scare away the birds and sigh in grief. One day, some Namdhari Sikhs halted for the night at mendicants' inn while on their way to Bhaini Sahib. They found the surroundings impure, foul smelling and detestable. Gurmukh Singh and Mastan Singh of village Pitho from among the group wanted to know more about the situation. They were told that the government had allowed the opening of the nearby butchery. Ranjha and a bad character by the name Heera butchers were pranksters. They did not care even for a prosperous Hindu, Khatri or a Sikh. The residents lamented that only Satguru can teach them a lesson, they were helpless. The Sikhs went to Chhiniwal from Raikot and called on Dal Singh. Some more Sikhs joined them. They decided to set the butchers right and save the cows. Next day, on 15th July 1871 (the 1st day of the 5th month savanna) they reached the Buta Ram Dera in Tajpur. Here along with Suba Giani Singh (alias Rattan Singh Mandi) and Rattan Singh Naiwala they performed a Havan. It was a day of torrential rain. Eight Sikhs (not including Suba Giani Singh and Rattan Singh Naiwala) went on to Raikot. It was a pitch dark night when they knocked on the door of the butchery and said they were travelers. When the door was opened, they attacked the inmates with swords and sharp knives. Three Sikhs stood guard at the gate and five others attacked with swords and sharp knives. They cut the ropes tied round the necks of the cows and set them free. It all happened within two or two and a half hour from eleven in the night. The Sikhs, after accomplishing their task, vanished in the darkness. They proceeded to Chhiniwal. On the way, they bathed at a well, changed their robes, hid their arms and went on their own ways. Nearby Hindu and Sikh residents were happy at the plight of the butchers. A police station was also in the vicinity but its authorities felt that let a calm prevail thereafter they would go for investigations. The Station House Officer reached the spot while it was still dark to take action, restore peace and save the injured. He found out that Dasaundhi Gujjar and his wife Bassi were killed. Seven persons, including women and a child were injured. The child died on the third day. Ranjha had fled the place jumping from the roof top. Heera also escaped the wrath of the Sikhs. Because of rain and storm the lamps could not be lit hampering investigations. It was difficult to follow the trail of the Sikhs in the rain and slush. The action, therefore, could start only in the morning of 16th July 1871. With the help of trained Bhanga and Bhupa, it was established that eight persons had gone towards Chhiniwal. Thereafter, two of them had gone towards Nabha state (The King of Nabha, Bhagwan Singh had died in 1871 without a descendant. Therefore, the British were ruling the state.) and six went towards Patiala state. The incident had happened in Ludhiana district. Deputy Commissioner Cowan reached the spot immediately. He asked for help from Maharaja Mohinder Singh of Patiala. Cowan announced a reward of one thousand rupees for anybody giving clues about the incident. Maharaja Patiala also announced a reward of 250 rupees. Nothing happened till 20th July. Then under duress and the greed for reward, Dal Singh of Chhiniwal confessed. He was with the Sikh group who attacked the butchers. Swords were recovered at his residence and he disclosed the names of Mangal Singh, Mastan Singh and Gurmukh Singh Pitho. His wife Ramo turned a witness. Attar Singh Pitho, a 12 year old son of Kahan Singh Kamalpur was also arrested. Suba Rattan Singh was arrested at Khanna and Gulab Singh from Chuharhchak. Except for the small boy, all others were chained and taken to Bassian Kothi. They were presented before a court. Satguru Ram Singh Ji had to appear in the court on 24th July 1871. He reached there along with 36 Kuka Sikhs, Subas and other prominent persons. He denied any information about the incident and also denied giving money to anybody for the purpose. Sessions Judge J. W. Macnabb awarded death penalty to Gurmukh Singh, Mangal Singh, Mastan Singh and Gulab Singh on 27th July 1871 based on the witnesses of Ramo, Daloo and Kahna. Judge C. Bolinos of Chief Mohinder Singh of Patiala Court, Panjab approved the punishment and Justice J.S. Campbell confirmed it. They were ordered to be executed on 5th August 1871 at Bassian near Raikot. The authorities however later realized that in the Amritsar case a eye-witness was needed. Gulab Singh (Gulaboo) turned approver and agreed to stand as the eye witness. After talking to him, Col Baillie reported to Amritsar that Gulab Singh will stand witness against the Kukas. Suba Rattan Singh and Rattan Singh Naiwala were imprisoned in Ludhiana jail on 28th July, 1871. Suba Giani Rattan Singh of Mandi and Sant Rattan Singh of Naiwala had committed no crime but were considered associates of the above martyrs and sentenced to be hanged to death in Ludhiana outside the jail premises on 26th November 1871. ( see Ludhiana).The governments determination to continue cow slaughter proved to be an effective instrument of their 'divide and rule' policy. The patience of namdhari Sikhs was now running very low. Coupled with the events in Amritsar, Raikot and Ludhiana the heroic Malerkotla incident was soon to follow. 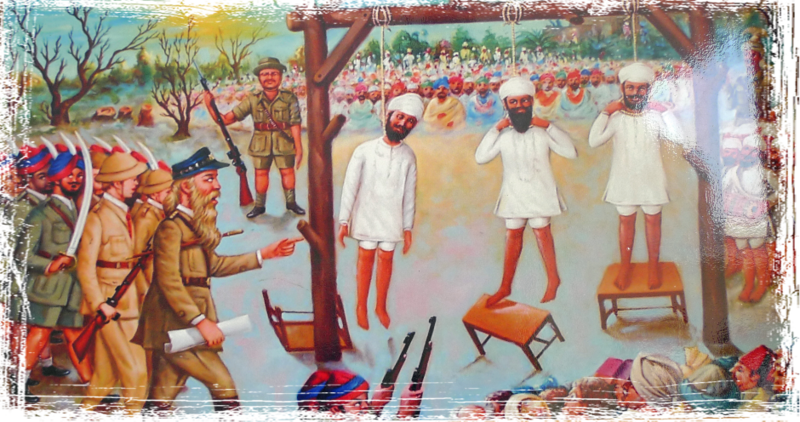 According to Nidhan Singh Alam, after the death penalty was confirmed, "the beloved Sikhs of the Satguru (Mangal Singh, Mastan Singh and Gurmukh Singh) were hanged at a tree near Bassian Kothi on 5th August 1871."